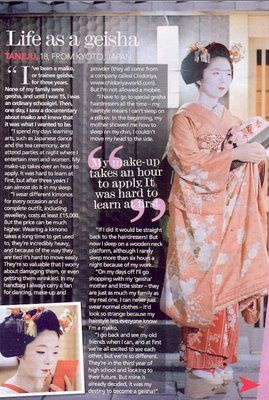 “I’ve been a maiko or trainee geisha for three years now. 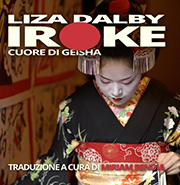 None of my family were geisha, and until I was 15 I was an ordinary schoolgirl. 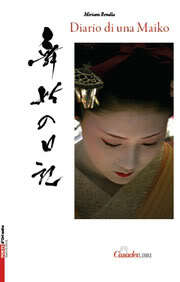 Then one day I saw a documentary about maiko and I knew that was what I wanted to be. I spend my days learning arts, such as Japanese traditional dance and the tea ceremony. I also attend party’s at night where I entertain men and women. My make-up takes over an hour to apply. It was hard to learn at first but after three years I can almost do it in my sleep. I wear different kimono for every occasion and a complete outfit including jewelry which costs over € 15,000. But the price can be much higher. Wearing a kimono takes a long time to get used to, they are incredibly heavy. And because of the way they are tied it’s hard to move easily. They are so valuable that I worry about damaging them, or even getting them wrinkled. In my bag I always carry a fan for dancing, make-up and powder (they all come from a company called Chidoriya) But I’m not allowed to have a mobile. I have to go to a special geisha hairdresser all the time: with my hairstyle I can’t sleep on a regular pillow. In the beginning my mother showed me how to sleep on my chin, I couldn’t move my head to the side! If I did it would be straight back to the hairdresser! But now I sleep on a wooden neck platform, although I only sleep more then six hours a night because of my work. On my days off I’ll go shopping with my geisha mother and litter sister — they are just as much as my family as my real one. I can never wear just normal clothes: it’d look so strange because my hairstyle lets everyone know I’m a maiko. I go back and see my old friends when I can, and at first we’re all excited to see each other, but we’re so different. They’re in their third year of high school and looking to their future.